Last weekend Dad's cousin came to stay with us, and being from Yorkshire originally we thought it would be nice to have some Yorkshire brews. Black Sheep brewery was started up by Paul Theakston (of Theakston's brewery fame) after a family dispute in 1991. The town of Masham is home to both Black Sheep and Theakston's so they are certainly spoiled for choice. 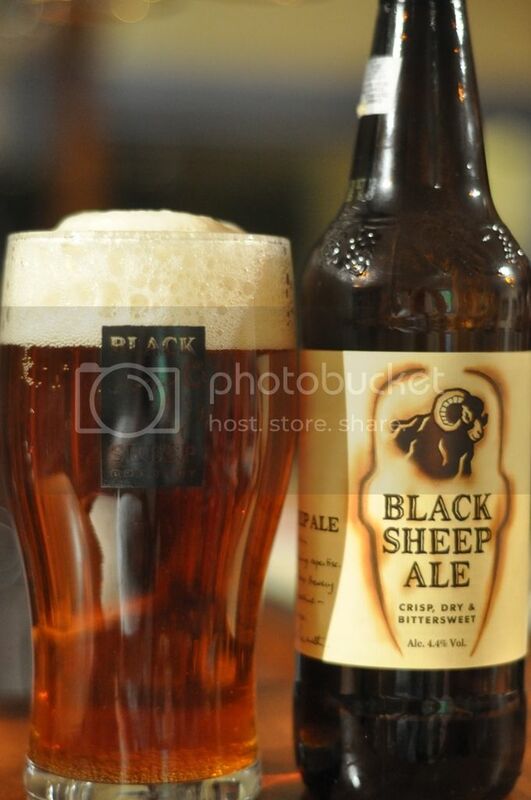 The Black Sheep Ale is a traditional English pale ale. The tag line is "crisp, dry and bittersweet" hopefully it can live up to that. Naturally we allowed this one to warm for a while before consuming, as no true englishman would drink a cold ale! The beer pours an amber colour with an airy off white head on top. As with any ale, there is little to no head retention however this one does manage to lace the glass quite well. The beer is slightly darker than I would have anticipated and actually makes it quite hard to see the logo on the glass! Poor marketing in one respect, but otherwise a really nice looking ale. Most ales have a strong aroma, and this one is no different! By no means is this aroma complex but it certainly smells good with the few powerful ingredients that are there. There is a strong caramel malt base which has a nutmeg-like spicy quality to it. I can also smell pear and peach flavours while the nose ends with vibrant citrussy hops. It's a really pleasant smelling ale, hopefully it tastes just as good. Black Sheep Ale tastes like no beer I've ever had before! There is the normal biscuity and caramel malts which starts off bitter and becomes sweeter over the course of drinking. It's much less fruity than the nose indicated however I can still make out some very faint pear. The hops are spicy and have strong floral aromas, they are a strange variety that I can't quite place. The finish is both bitter and sweet at the same, it's delicious! I don't drink alot of real ale, mostly because it doesn't usually travel well or isn't bottled. This one has travelled really well and is everything the front of the bottle promises. The beer is crisp and dry in both flavour and mouthfeel and has a delicious taste which is strangely bitter and sweet at the same time. Black Sheep Ale is a winner in my books and is certainly worth a try if you can get your hands on it, be prepared though it's very different to anything we drink in Australia.